Remember those pinto beans, corn, and browned ground beef from the Southern BBQ Bowl the other night? What about the leftover kale that you chopped for the Thai Peanut Sate Bowl? Don’t let them just sit in the fridge. Let’s take a virtual trip to Mexico and turn those leftovers into a Mexican Taco Bowl! Overlapping ingredients save you time and money since you chop and prep once, and eat multiple times before things go to waste. Plus you don’t get bored to tears eating the same dinner night after night. Keep things fun by mixing up the combinations and flavors. Everyone is in charge of what goes into their bowl, so you get to have more of what you like and less of what you don’t. Drain and rinse the pinto beans and season with salt and pepper, if desired. Heat the beans in the microwave until warm. Slice the veggies as desired, and steam the kale and corn lightly in the microwave until warm. Layer the beans, kale, corn, and radishes in a bowl. 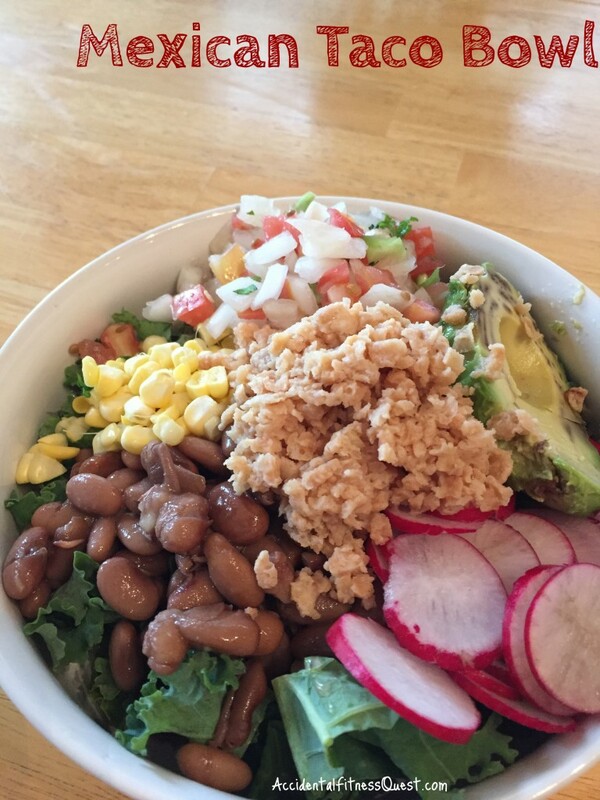 Top with pico, avocado, and your protein of choice. Sprinkle with the taco seasoning and other taco toppings. Enjoy! Makes 4 bowls at approximately 275 calories each – 12g protein, 41g carbs, and 7g fat (not including the added meat, burgers, pork, etc). You can easily mix this up by using different proteins that you prepped ahead of time – grilled chicken, steak strips, ground turkey, shrimp or fish for a fish taco bowl. Change the beans to black beans. Use any salsa that you have in the house. That’s the fun part of dinner bowls. You get to make it your own without needing to hit the grocery store first. Tell me, what’s in your bowl?